We use a myriad of tools to run our company, and there are a ton of options for nearly every business process. Below is a guest post by Alex Devkar, co-founder of Conspire, a service that analyzes email to find out who we know and how well we know them. I spend a lot of time in email every day. The result is that my Gmail account has a lot of data ripe for analysis. I love ShuttleCloud’s Gmail Meter because it takes that data and turns it into insight about how I use email. 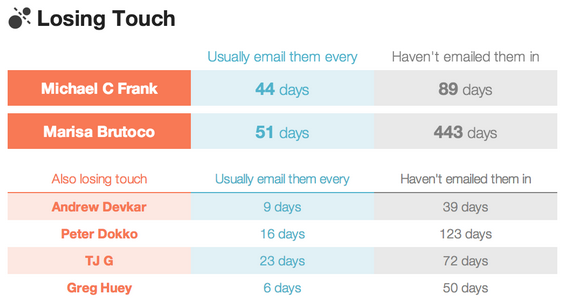 It turns out that I respond to over 70% of the emails I receive in < 1 hour, but I take more than a day for 15%. In other words, if you don’t get a response from me right away, it’s probably going to be a while. We at Conspire put a different lens on the same email data. We seek to understand the strength of your relationship with each of your contacts, so that we can tell you how you communicate with each one and remind you to reconnect with people you’re losing touch with. Nearly everyone with importance in my personal and work life has touched my inbox at some time. It’s surprising to see how many people I interact with via email. This is why email is a great data source for learning about my network. 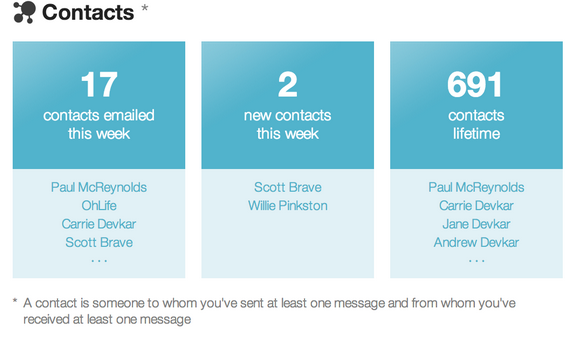 This week I exchanged emails with 17 people, 2 of which were new—a light week for me. Now we focus on the people who got the most attention this week. My co-founder, my wife (whew!) and my accountant show up here. 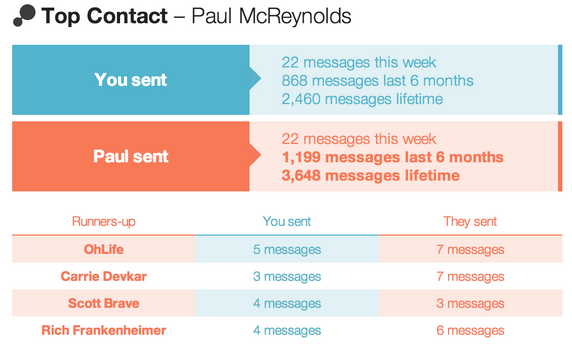 I tend to only reply to messages when a response is required, which is why I sent fewer messages than my top contacts sent to me. I don’t want to seem aloof, but I also don’t want to unnecessarily fill up other people’s inboxes. Response time is very important to me. When someone needs something from me, I try to get it to them as quickly as possible. 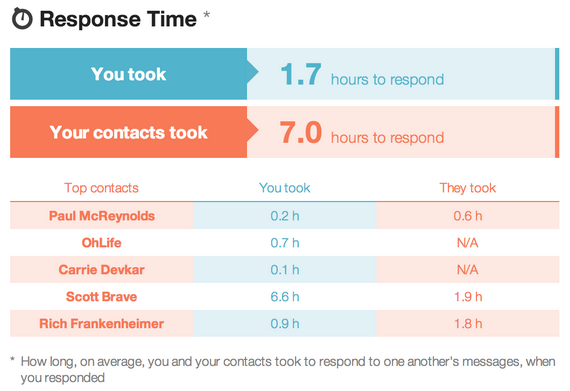 My goal is to keep average response times < 2 hours, especially for the most important people in my life. Conspire strives to not only recap you what you did the past week, but also what you can do to improve your network going forward. We identify people who you have or have had a strong relationship with that you haven’t contacted recently. These are great reminders to reconnect with friends, family, classmates, and colleagues. Email is a rich data source. Our email accounts know all of our contacts, when we last spoke with them, how frequently we communicate, and how quickly we respond to each other. In other words, our email understands who we actually know and how well we know them. We think this info ought to be put to good use, which is we we’re building Conspire.